A better behaved dog is right at your fingertips. If your furry friend is trying your patience with unwanted behaviours like digging, chewing, jumping up, hurdling fences, pulling on his leash - and, most important, not coming when he's called - our remote trainers could be just what you need. With our remote training systems, you can train your dog from a distance while he's off-leash. Using a handheld transmitter, you can choose to deliver a static correction - a harmless electrical sensation - via your dog's collar when he displays a behaviour you want to change. Remote training puts the solution to unwanted behaviors in the palm of your hand. Before you know it, a behaviour you love will replace the one you don't. Then you'll be able to take your pal with you wherever you go and he'll obey your commands as if on a leash by your side. And that means a lot more freedom for both of you. 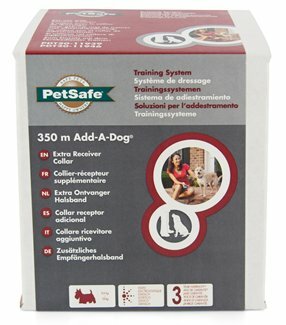 100m BIG DOG TRAINER - For pets over 18 kg (40lbs). Your furry pal may be big, but that doesn’t mean he can’t be trained. With this deluxe system, you can train your dog at home or at the park – up to 100 metres away. There are 16 levels of stimulation, plus a tone-only option to help remind your big guy of all he’s learned without the stimulation. 100m LITTLE DOG TRAINER - Suitable for dogs 3.6kg (8lbs) - 18 kg (40lbs). With this deluxe system, training your little pal is easy. The lightweight receiver is made especially for small dogs, and the unit is equipped with 16 levels of correction and a range of up to 100m. Go ahead, take your pal out into the world with the confidence that he’ll behave. 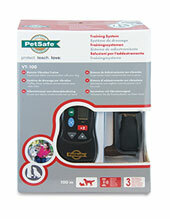 The PetSafe® 275 m Deluxe Remote Spray Trainer has been proven comfortable and effective for pets of any size. 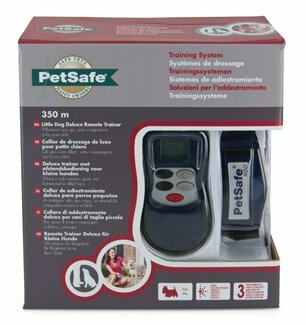 This system assists you in managing your pet without a lead in a range up to 275 m. There are 15 levels of Spray Stimulation, a Tone Button, or Tone + Spray to reinforce training. 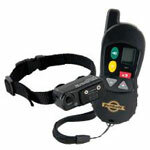 The Handheld Remote sends a signal activating the Receiver Collar to spray. Using the 275 m Deluxe Remote Spray Trainer consistently and correctly, many misbehaviours that your pet exhibits can be eliminated and any basic obedience commands can be taught. Experience a new way to communicate with your dog. 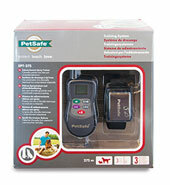 The easy-to-use PetSafe® VT-100 Vibration Remote Trainer features 16 adjustable vibration levels. You can teach standard commands or eliminate misbehavior. 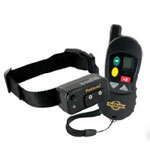 At the push of a button, the handheld remote transmitter sends a signal, causing your dog’s receiver collar to vibrate. The vibration safely and effectively gets your pet’s attention. You’ll spend less time training and more time enjoying your dog. The random vibration pattern is perfect for training deaf dogs. Control your pet without a lead within a range of up to 100 metres. The trainer has been proven safe, comfortable and effective for both small and large dog breeds. Using the Remote Trainer consistently and correctly, any basic obedience commands can be taught and many misbehaviours that your pet exhibits can be corrected. Train your pet to accompany you anywhere without a lead. 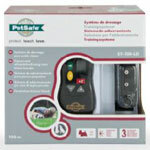 The PetSafe® Deluxe Remote Trainer supports obedience training and is comfortable and stylish for you and your pet. 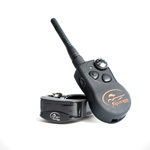 At the push of a button, your remote sends a signal activating your dog’s Receiver Collar. He receives a safe but annoying stimulation. He’ll quickly learn the association between his behaviour and your correction; in no time, you’ll have a better-behaved pet. Add multiple pets to one remote. 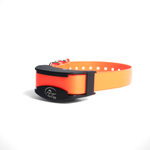 This extra Receiver Collar is used to add another dog or as a replacement collar to the 350 m Little Dog Deluxe Remote Trainer (PDT20-11939) and the 900 m Big Dog Deluxe Remote Trainer (PDT20-11946). At the push of a button, your remote sends a signal activating your dog’s Receiver Collar. He receives a safe but annoying stimulation. He’ll quickly learn the association between his behaviour and your correction; in no time, you’ll have a better-behaved pet. The PetSafe® Big Dog Deluxe Remote Trainer has been proven safe, comfortable, and effective for dogs over 18 kg. Add multiple pets to one remote. This extra Receiver Collar can be used to add another dog or as a replacement collar to the 900 m Big Dog Deluxe Remote Trainer (PDT20-11946) and the 350 m Little Dog Deluxe Remote Trainer (PDT20-11939). You’re in confident control with the SportHunter® 1825 from SportDOG Brand®. This electronic remote training collar features up to 16 stimulus levels and a choice of momentary or continuous correction. Vibration and tone options further help you build a customized remote training system to guarantee the best performance from your dog. User can select from 8 stimulation levels each within low, medium or high setting on the compact receiver. The SD-1825 system is also fully customizable, allowing you the flexibility to set 2 or more transmitters to control the same Collar Receiver. With a 1 mile range, a slim-profile Collar Receiver that ensures a perfect fit, and a compact remote transmitter that’s easy to handle, the SD-1825 delivers on our promise: Gear the way you’d design it®. 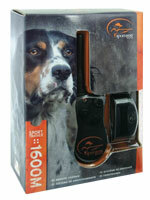 The SportHunter® 1825 can be easily expanded to control up to 6 dogs by adding SportDOG Brand® Add-A-Dog® collars.